Blending the flavors of the West and Far East, award-winning Wolfdale’s menu reflects the seasons by emphasizing fresh, simply and elegantly prepared cuisine, aesthetically pleasing to the discerning palate. 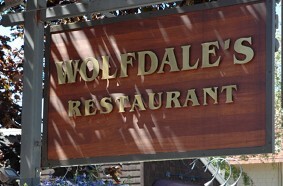 Wolfdales is a restaurant that has built a reputation for over three decades, priding itself on East-West style cuisine. The kitchen radiates of only fresh food that is simply prepared with a variety of American and Asian-inspired dishes. Summertime deck. Garden weddings. Dinner nightly.